Convinced that the key to reuniting with his estranged father is to pray for the hapless California Angels to win the pennant, a boy finds his request answered by some heavenly helpers only he can see. A charming and fun-filled updating of the '50s diamond comedy, co-starring Danny Glover as the brash California manager and Christopher Lloyd as his angelic counterpart; with Tony Danza, Brenda Fricker. 102 min. Widescreen; Soundtrack: English Dolby Digital Surround; Subtitles: Spanish, French. 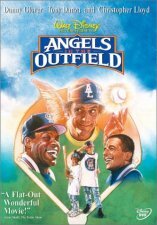 Two-disc set includes "Angels in the Outfield" (1994) and "Angels in the Infield."